132 min [ Freedom. Country. Honor. Passion. To save his best friend, one man must risk everything he loves. ] 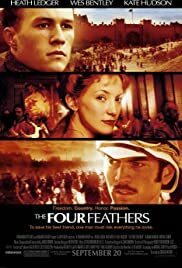 - The story, set in 1875, follows a British officer (Heath Ledger) who resigns his post when he learns of his regiment's plan to ship out to the Sudan for the conflict with the Mahdi. His friends and fiancée send him four white feathers which symbolize cowardice. To redeem his honor he disguises himself as an Arab and secretly saves the lives of those who branded him a coward.